It’s common for a spacious kitchen to seem a bit cold and uninviting if improperly designed. There is no reason for you to feel that your open kitchen is boring if you understand how to improve comfort and coziness with our kitchen design solutions. The simple addition of large lighting features or a unique tile backsplash can create a very noticeable improvement that your family can enjoy. The area behind your stove should feature a different tile style than the rest of your kitchen. It’s a great opportunity to splurge on hand-painted tiles or something more unusual. Considering the limited amount of space above the stove, you can complete this job with a small amount of high-end materials. Pendant lighting is very eye-catching, especially if you give it a central placement in the room. Installing decorative lighting over the central island or countertop is going to draw the eye for a dramatic balance. You could add consecutive lights of the same style if there is room available. In a large kitchen, you don’t have to worry about going overboard because it will make the room feel more cozy. An open floor plan often includes wasted space that is unused and empty. A small bistro table with additional seating provides another place for guests or family to relax and have a conversation. As long as it’s out of the way of the cooking area, it’s going to help fill the space in a valuable way. 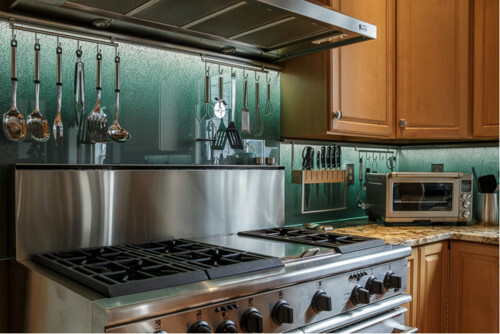 Metal appliances are sleek and reflective, but that might not be the most inviting style for your space. Large appliances that will match the same style and finish as surrounding cabinets are going to be more appealing than cold steel. Small appliances are easy to hide in storage areas under the counter to make the room clean and clutter-free. We look forward to getting started designing your kitchen project as soon as you complete the contact form. Our designers have plenty of additional solutions that will help you create a cozy and inviting atmosphere.